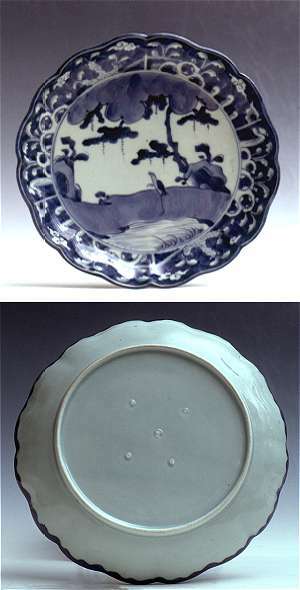 From the pictures supplied this blue and white Japanese plate seems to date to the mid to early 18th century. It is a typical example of the good quality export porcelain that was made in Japan to cater to the western markets after the slump in Chinese export that had occured during the 17th centuty. It is 21 cm or 8 inches in diameter and is heavily potted to stand the perils of international shipping. The decoration is reflecting the Chinese late Ming Wanli period style with a crane standing next to a pond against a background of a garden scene with pines and Daoistic garden meditation rocks. The decoration is executed in the slightly muffled shade of Japanese cobalt typical of the period. Within the foot rim we find five marks from the kiln supports - used to stop the flat porcelain pieces to sag or become warped in the heat of the kiln. This is a typical feature on old Japanese porcelain that continues into the mid 19th century however getting fewer and fewer. On later porcelain we would normally only find the marks after one sole support. To the collector it is interesting to note the uneven distribution of the "spur marks", quite different from the perfectly symmetric marks that sometimes are deliberately added on later reproductions.